A musical surprise on the canal. 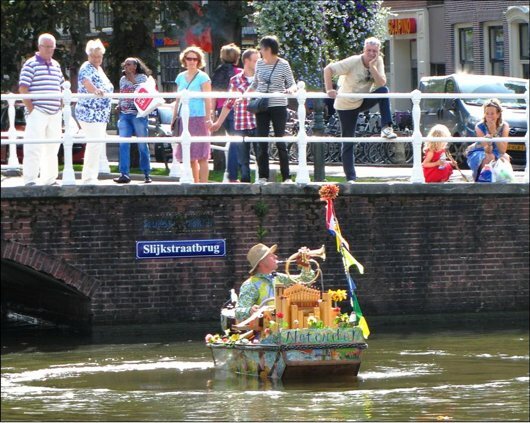 On a late summer Saturday, when I was cycling along a canal here in the centre of Weesp, I heard curious music. I noticed that other people were also wondering where that sound came from. Suddenly, there he was ! Steaming in from under a bridge, in his tiny little boat. Blowing on a trumpet, then a horn, while turning the wheel of a small street organ. And this unusual combination sounded surprisingly delicate, really nice ! He played a couple of songs. Then he stood up in his cockle-shell. Greeted, and wished everybody a life of beauty and happiness. After that, he quietly sailed away, in the direction of Amsterdam. I never saw the man before. Nor did anybody else, as far as I could hear. Months later I stumbled upon a couple of video clips on YouTube on this same man and his remarkable performance. His name is Reinier Sijpkens, and apparently he loves to make flash appearances here and there. Playing a duet with the bells of the Old Church in Amsterdam - hilarious ! Sailing in from under a bridge on an Amsterdam canal.